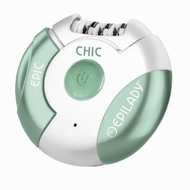 The Epilady Epic Shave is a rechargeable wet/dry lady shaver small and compact which is perfectly designed to fit the natural curves of a women's body. Trimming system for intimate areas that guarantees perfect hair length for shaving. Built-in rechargeable batteries offer 45 minutes shaving time. Kit includes adapter cleaning brush carrying case and instruction manual.